I thought the timing was right for this first place short story. The news too often is filled with suicides, gang wars and school shootings. Most of us feel helpless to make a change. But I believe it all begins with family. We teach children values and morals through our words and actions. Bullying, rejection and hurtful words last a lifetime. But, so do acceptance, friendship and love. I hope that no matter where you are in this world, you show compassion for others by your words and actions. You never know the crosses they carry or how your words will affect them. I invite you to share your thoughts and stories so that we can join hands in making this school year a great experience for all of our future leaders. Lakeisha cursed to herself as she gripped the blank notebook with one hand while using the other to push a divergent black curl out of her face. The January winds whipped furiously as she waited for the bus to arrive. The English assignment, due Friday, wore on her mind. Normally, she’d be finished by the time she got home from school. Not this time. For two days she’d stared at the paper, the words refusing to bleed from her pen. “What is your dream?” Ms. Lowery made it sound as if every student lived a normal life, complete with options and the financial support to achieve them. “College? Career? Travel? Write what you want to happen” Did she have any idea what my life is like? NO! The question seemed cruel to the new transfer student. I have no dreams. Lakeisha lived in the real world, filled with responsibilities and hardships, drugs and booze, bill collectors and angry people. Her days left no room for dreams. With a mother imprisoned for selling drugs and a father killed when she was five, the chance of having a successful career was improbable. College was out of the question. A high school education, if she were lucky enough to finish the year, would get her a minimum wage job. Many of her classmates had applied to numerous colleges and waited anxiously to hear from each. Her goals? The first, survival, avoiding gang fights that erupted into gun battles at any given time. Walking from the bus stop to her front door involved risk. The second, keeping the electricity on. Dreams? How am I supposed to write about such foolishness? There had been much controversy between the districts when the decision was made to transfer students from failing inner city schools to academically successful ones in affluent neighborhoods. At first, Lakeisha felt a tinge of excitement, holding out hope that she’d make new friends and learn useful skills. Hope faded quickly during the first week. The long commute added more stress to her day and limited the hours she could work. Cliques of girls that didn’t look like her, didn’t speak like her, and didn’t dress like her, whispered and giggled as she walked alone through the long hallways. Even the boys said lewd and offensive things, much like those in her old school, just in hushed voices. Lakeisha knew why she’d been unable to complete the assignment. She wanted to tell the truth, not lie or pretend her future held magnificent opportunities. Dreams required more than just imagination. She wanted to respond to the snickers as they pointed to the same pair of shoes she wore every day. Her threads came from nearby dumpsters or Goodwill, hardly the place to find a dress for the upcoming prom. It hurt to watch the students snub their noses at lunch menus and throw away perfectly good trays of food, knowing how many times she’d stood in soup lines waiting for a meal. Their spoiled, over-indulgent lifestyles sickened her. The anger boiled inside her head as she squeezed her pen. Suddenly, the words spilled across the paper. One page filled, she flipped the notebook and began another without pausing. The furor didn’t’ stop until ink seeped to the edges of a dozen pages. With trembling hands, Lakeisha slammed the notebook closed, pressed it against her chest and glanced around to reassure herself of the private moment. The corners of her lips turned upward in acknowledgement of her decision. I’m done! And I’m going to turn this in, no matter the consequences. Sleep evaded Lakeisha as she tossed and turned in bed, bits and pieces of her essay inching through the protective wall that normally kept her worries at bay. Did I share too much? What if I have to read it out loud? Would it be worse than it already is? Fear rose in her throat and she jumped up from the bed. I should rewrite it. The frantic doubt that had unnerved her earlier settled down to a vibration. She placed the unopened notebook on top of her coat, convinced the words had needed to be written and now they must be heard. I’ll be a voice for others. Lakeisha held the papers tightly on the twenty mile ride to school. Silently, she repeated her conviction. I have a voice. I can make a difference. It took hold and by the time the bus arrived at school, she held her head a little higher than normal and smiled as she strode down the busy hallway. “Sorry for the thumbprint, Ms. Lowery.” Lakeisha mumbled as she laid the assignment on the paper-free desk, aware the rest of the class had submitted their stories electronically, not scribbled on lined paper. Her words rang like an empty promise, one she’d heard for months. I’ll be gone before it gets here. The essay lingered in the back of her mind the rest of the day and throughout the weekend. Her emotions rode the wave from excitement to fear. One minute proud of her courage. Then next, kicking herself for lowering the wall. Upon arrival in English class on Monday, Lakeisha was greeted by Ms. Lowery. “Mr. Hackmann? Why? I didn’t do anything!” The announcement rattled in her brain. Oh, Crap. My essay. They’re going to send me back to my old school. “You can put your books down first.” Ms. Lowery looked at the blackboard as she spoke. Lakeisha left the room on trembling legs, stopping at the water fountain to sooth her parched throat. A bright light shined on the metal object, her mouth agape at the brilliance as she searched for the source in the windowless hall. Suddenly, the place she’d dreaded walking down every day took on a significance she’d not previously considered. My ancestors were never allowed to walk this hall, much less quench their thirst from this fountain. The unexpected affirmation filled her with renewed courage. Changes were made by brave people who dared to speak up. I have a voice. I can make a difference. She repeated the mantra as she walked through Mr. Hackmann’s office door. “I was fine until I got called to see you. What did I do?” Lakeisha’s voice sharp, but respectful. “I understand you wrote this essay.” He passed the lined papers to Lakeisha as he spoke. “Yes, sir. I did.” Lakeisha straightened her back and look directly at Mr. Hackmann, prepared to defend her assignment. “And?” Her question blurted out more defensively than she’d intended. Lakeisha stirred in her chair, unsure how to respond. “You’re not mad at me?” Lakeisha tucked a curl behind her ear and leaned forward. “Share your story with the entire school. Every teacher and student needs to hear what you have to say.” Mr. Hackmann raised a brow and waited for her response. “Teenagers can be hurtful, but I’ve seen the same students rally to support injustice when an issue is brought to their attention. Everyone needs a reminder of the things we take for granted. Your essay delivers a lesson they won’t soon forget. I hope you will give them a chance to show you. The gymnasium buzzed with questions regarding the school assembly. A voice loud enough to be hears across the room drew Lakeisha’s attention. “What she’s doing up there?” One of the students glared at Lakeisha who sat on a folding chair a short distance from the stage. You’re not going to rattle me today. This is too important. Lakeisha directed her attention to the hundreds of students taking their seats. Ms. Lowery worked her way through the crowd and settled into the chair next to her, gently touching her arm with a reassuring nod. Mr. Hackmann called Lakeisha to the podium. She stepped forward, forcing her shoulders back and raising her chin. She inhaled slowly, repeating her mantra in silence then began. “I’m Lakeisha…Jackson…a transfer student from Roosevelt High.” She glanced down at the ink filled pages for reassurance, then raised her head and continued. “I’ve been asked to share my story with you today.” Quiet murmurs buzzed the room. “More than 50 years ago Dr. King addressed the sacred obligations of the Constitution and Declaration of Independence in his speech, I Have a Dream. His words inspired significant changes, changes that I’m privileged to experience today, just by being in this school.” Lakeisha paused, searching the room for reactions. “He also spoke of the ‘tranquilizing drug of gradualism.’ I didn’t understand what he meant until recently. “He was saying that while America has made tremendous strides, there‘s more work to be done. Ms. Lowery assigned an essay, ‘What is your dream?’ I’ve been asked to share my response. This is what I wrote.” Lakeisha spoke slowly, deliberately as she read her essay, allowing the words time to penetrate. When she finished, Julie, the cheer leading squad captain, stood and clapped slowly. Joshua, a football quarterback followed, then another and another. Soon the entire audience joinrf in a deafening applause. “I can do that.” Lakeisha stepped away from the podium, moving toward her seat. Lakeisha’s eyes widened and a smile spread across her face as she accepted the gift. “Thanks.” The room exploded in another round of applause. Maybe I did make a difference. Blogs, email, text, twitter, FaceBook and occasionally, a phone call or face to face talk. So many ways to connect to others. But how do we connect with friends and family who have dementia and are losing or have lost these lines of communication? I wrote this poem during the final stages of my mother’s journey through Alzheimer’s. I think it’s what she would have said. Perhaps you have a loved one who just needs to hold your hand. Don’t miss the chance to visit with him or her. Words aren’t always necessary. Silence has a voice. Hurricanes Harvey and Irma left thousands of people homeless and in desperate need of assistance. Well deserved attention was given to the humanitarian efforts by those who helped provide food, clothing, shelters and money to the victims. The heroes who saved and sheltered thousands of animals during these tragic times deserve a round of applause, too. Thank you, wherever you are. Here is a short story I wrote after a flood some years ago in Missouri. I hope you enjoy it. River Rats. That’s the name for people who live near the river, refusing to give in to the unpredictable vengeance of Mother Nature that sometimes makes life challenging. My master, Jessie, is a river rat. Not sure what that makes me, but I live with him along the Mississippi near a dam in Missouri. His house sits on stilts as tall as some of the nearby trees. 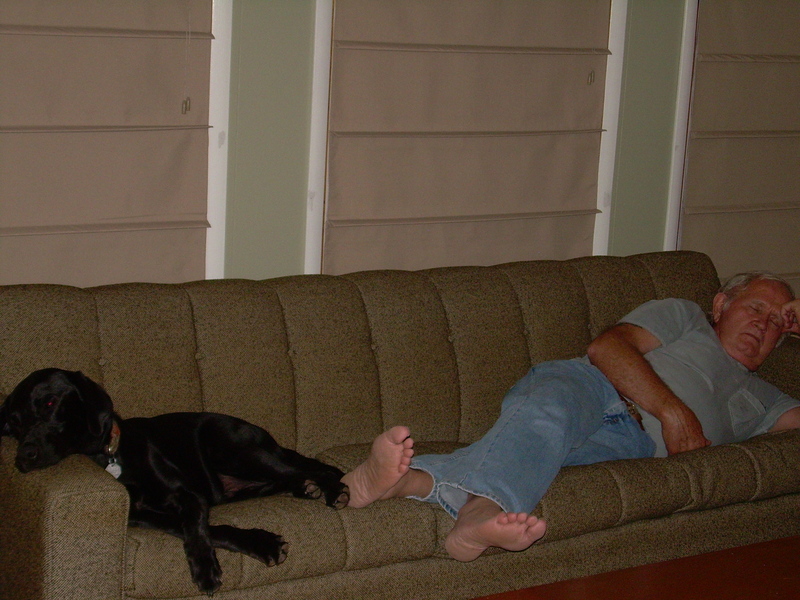 I’m Clyde, a yellow lab who lives in a large kennel next to Jessie, but on the ground…well most of the time, anyway. Living by the river is fun for the most part. Jessie takes me along when he hunts because I can pick up the scent of other animals faster with my keen nose. When I spot something, I chase it until it runs into a bush or a corner and can’t get out. Sometimes they get away, but most of the time Jessie takes it from there. I do other things too, like protecting Jessie by warning him if something seems out of the ordinary. One time, I even saved his life by fighting a water moccasin that snuck out of the rocks by the boat dock. Jessie gave me some extra treats after that and patted my head, which I really liked. I’m an outside dog. Jessie doesn’t let me in his house, but in the evening as the sun goes down, I get to pounce up the stairs and sit on the porch while we watch these big boats, think they’re called barges. They shine their bright lights to the right and left as they inch forward toward the dam. Jessie doesn’t care for it when they shine the lights on us. He gets mad and yells at them, but they still do it anyway. Winter’s ok because I get to go hunting. Spring used to be my favorite time because there are more things to sniff, like rabbits and field mice. Last year changed that. Mother Nature forgot to turn off the faucet. Once the rain started, it didn’t stop. Days turned into weeks and the continuous pelting began to irritate me. I had to eat fast or else my food would float in water and get mushy. I hate that. I also missed our special time together on the porch and the extra treat he gave me before putting me back in my kennel when it got dark. I never shirked my duties though. I kept an eye out for strangers but no one came over the levee. Seemed all the animals had run off to higher ground, even the birds were gone. No stray cats, no deer. The only movement came from Jessie as he loaded the lawn mower and other things onto a flatbed trailer. I wondered what was up. The next morning, Jessie filled my bowl with food and patted my head. My tail wagged as fast as my heart beat. I loved it when he petted me. Made me feel good all over. But the feeling quickly passed when he said, “Take it easy buddy.” He got in his truck and drove off, over the levee. I whined for a while, but decided it wouldn’t do any good as no one could hear me. The rain never stopped and I watched the river’s edge creep closer and closer to my cage. I sniffed every inch of the cage trying to find an opening, then I jumped up and down trying to unlock the gate to get out. I started to panic, barking and pacing continuously, but every time I moved, the kennel weaved up and down making me lose my footing. What the heck? My whole kennel was floating, just like when Jessie takes me fishing. Just before dark, I saw some movement on the levee. I barked again hoping Jessie had come back for me. It was him and my tail wagged anxiously as he climbed into a boat. He glanced at me, but kept on paddling toward his house, then went up the stairs, dragging a long rope, one end attached to his boat and the other he tied to the porch railing, way at the top. That’s when I began to worry. The water kept rising and so did my kennel. I tried to stay awake to keep watch but sometime during the night, I dozed off. The next morning a noise startled me awake. I barked, to warn my master just as a large tree branch smacked into my cage. I shook off my slumber and gave another yelp, hoping Jessie would come get me. Waves tossed my cage up and down and the sudden movement made me stumble. I almost laughed (yes, dogs can laugh), thinking I looked like Jessie when he drinks too many brown bottles, but the seriousness of the situation worried me. I adjusted my footing and paced around the kennel, proud of the balancing skill I learned while riding in our boat. Hours later, I heard a door shut and Jessie walked halfway down the stairs where the river greeted him and pulled on the rope until the boat was near enough for him to get into it. I watched anxiously as he rowed next to my kennel and unhooked the latch. I stuck my head out trying to get into the boat with him, but he blocked my path. “Stay,” he commanded as he cleaned out some of the mess in the kennel. Lots of leaves and branches and other stuff I won’t mention covered the floor. “Scary as hell” I wanted to shout, but could only whimper in reply. He rubbed my ears and then gave me some more food from the large tin can in the corner of the cage. I had no idea what he meant by that, but I tried again to get past him and into the boat. Surely he’d take me with him. It wasn’t fun being out here all by myself. That didn’t sit well with me, but I didn’t have much choice as he closed the door, then paddled toward the levee. My eyes blurred as I watched my best friend fade from sight. Later that day, the rain slowed to a drizzle and I walked around the cage trying to work out some of the aching in my legs. I noticed the pads on my paws were getting sore too, so I went into my house and rested. Darkness crept in and my cage continued to rise. It’d been a long time since I’d seen Jessie or any other creature. Something must have happened to Jessie or he would have come back for me. Hunger made my belly grumble and I remembered the food in the can. Pushing the lid with my nose didn’t work, so I jumped on the can and it fell over, popping the lid off. The food spilled all over. Thankful to be able to eat, I scarfed down as much as I could because I knew the rain water would turn the rest into mush soon. My body twitched and ached more every day. It got harder to stand up and walk around. I hated the musty smells, even myself. Yuck. I forced myself to sniff around the cage for something to eat. Everything was gone, even the mushy stuff and still no Jessie. Maybe he was hurt. Maybe he needed me. The water level no longer rose, but it wasn’t going down either. I stared at the levee and decided I might be able to paddle to it, if only I could get out of the kennel. Maybe Jessie was on the other side waiting for me. The next few hours, I jumped and nudged my nose and teeth at the latch with no success. Worn out from trying to get the gate open, I laid down and fell asleep. Another large branch slammed into my kennel and startled me awake. As I walked around inspecting the damage, I saw a break in the metal links and with renewed spirits, I chewed and pawed until the hole was big enough to escape. Without food, I wouldn’t last much longer. The decision was made and with one last look around my kennel, I squeezed my body through the opening and made my way into the water. The cold, swift current grabbed me and dragged me away from the levee and the safety of my kennel. Oh, no! What did I do? I paddled furiously trying to get back but within seconds, my doghouse faded from view. I wondered if I’d ever see dry land again, or my buddy. Exhausted from trying to fight the current, I held my head high, trying to stay above water, and floated with the current. The cold water made my legs stiffen and cramp. My head kept going under and the river threatened to take my last breath, but I fought back with everything I had left. Just then, a large branch floated close enough for me to snag it with my mouth and I managed to get one paw over it, then the other. After a while, the current slowed and the branch, with me still hanging on it, moved toward the bank and became lodged near a boat dock. I decided I’d had enough of the water ride and managed to pull myself up onto the platform. Tired, but determined to get back home, I climbed one concrete step, legs wobbling, then a second. Near the top, I collapsed, completely spent, but happy to be out of the water. I closed my eyes, trying to slow my breathing as my chest heaved up and down. The unfamiliar voice stirred me from my sleep. I opened my eyes, yet couldn’t find the strength to lift my head. “What’s wrong Gladys?” a male voice called in the distance. Into the house? Are they’re going to take me into their house? Harold appeared with a large blanket and wrapped it around my wet fur. I tried to lick his hand in appreciation. Harold grunted as he lifted me and then carried me into his living room, placing me on the warm, soft rug. Gladys appeared with a bowl of water some scraps of meat in her hand. My eyes widened when I saw what was in her hand. Bacon! This must be Heaven. I think I’m going to like it here. If I could only convince him there’s no need for a wife. Thanks to my husband for allowing me to share his photo. I confess. I have never read the Twilight series http://www.stepheniemeyer.com/twilightseries.html. My remote control would never stop on a channel airing The Vampire Diaries http://www.stepheniemeyer.com/twilightseries.html. I’d rather go to the dentist than be forced to watch a blood and guts movie. The ability to create fantasy escapes me. In fact, I have a difficult time closing my eyes and imagining that I am someplace I’m not. Perhaps my DNA makeup does not include much of the imagination gene. My interests focus on real life stories, not the reality shows aired on television today, but the slice of life stories of everyday people. Humor often serves as my crutch in difficult times and I make light of challenging situations rather than defer to the martyr syndrome, as evident in my book, Peaks and Valleys http://www.amazon.com/Peaks-Valleys-Mrs-Diane-How/dp/0967490170. While my imagination may be limited, I still love to write and my dream is to write other people’s stories. I firmly believe everyone has a story, although I find most people think no one would be interested in hearing about his or her life. It doesn’t require imagination to write someone’s life review. It does take time to listen and ask open-ended questions and it takes honesty by the person who is sharing their story. The end product can serve as a legacy for younger generations who will someday want to know about their ancestors’ journey. The Missouri Humanities Council and Warriors Arts Alliance http://www.mohumanities.org/proud-to-be-writing-by-american-warriors/ recognized that the unembellished stories and poems written by veterans do not need props or imaginary characters to be worthy of inclusion in their anthology of remarkable and inspiring stories. In fact, they currently are accepting admissions for their next book. 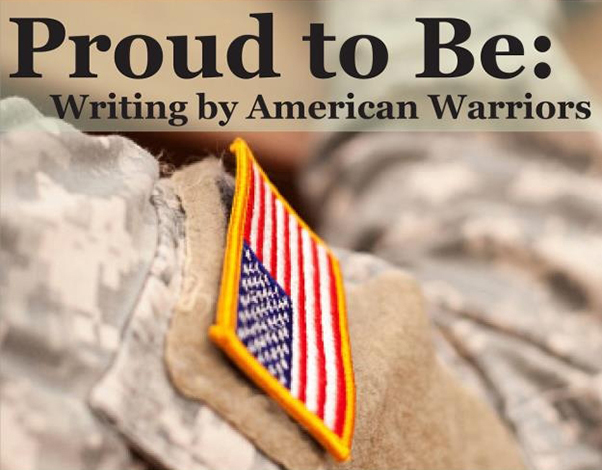 At a recent writers meeting http://www.saturdaywriters.org/, I listened while four American veterans read excerpts from the recently published book Proud to Be: Writing by American Warriors. Their tales brought tears to my eyes and stirred intense feelings from years of reading similar letters while working for the Department of the Army. Although the painful process of writing the story reflected in the quiver of each voice as the scripted words were read, there was a therapeutic benefit for each of the veterans. Each shared his reason for having done so during the question and answers period that followed. Having listened to the veteran’s stories, I realized that not all writer’s need to have a vivid imagination. While my reading material and viewing time is limited to less imaginative works, there are many possibilities for me to suceed in my writing efforts. How about you? Do fanciful characters dance in your head? What stirs you to pick up paper and pen and write?